Our prepress services insure right out of the gate that your catalog is on track for success. Our print quality enhances the products you showcase. 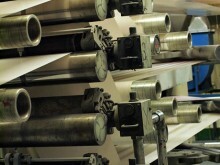 Our bindery capabilities provide you with flexibility in marketing the products of that particular catalog. Intangibles like our customer service and technical support, quite frankly, make your job easier. And innovations like InSite™ and RightSize™ keep you in control and save you money. Yes, we get it. And what you get is a catalog you can be proud of and that gets results. Welcome to The Dingley Press. Let’s get printing!